Bridgewater, New Jersey - Ready for a Real adventure right from your iPhone? 288 Vroom LLC has announced the release of The Hunt - Haunted Halloween Episode. With The Hunt - Haunted Halloween Edition, you will travel to some of the most haunted, most terrifying, and most mysterious REAL places around the globe all in the palm of your hand! The Hunt is unlike any other adventure game you have ever played. Solve riddles based on Real-World places and events and then find and visit those places on the interactive satellite-image map of the Real world. It's almost as if you are actually there. Not only will you see the location, but you will see everything else around it. With just you and your trusty iPhone, iPod touch, or iPad, you will feel as if YOU have become Indiana Jones himself. The Hunt - Haunted Halloween Edition is more than just a game, it's a journey and experience through the world's haunted history. Pack up your gear and get ready for an adventure like no other iPhone app! Join The Hunt Now!!!! Don't wait, join The Hunt Now because 'THE HAUNTED HUNT IS ON' CONTEST is happening now. The first 10 people to email 288 Vroom with all the locations of the Full Version will WIN A FREE COPY OF EVERY one of their current apps. The Hunt is a challenging game, are you up for it? * Solve puzzles and riddles based on some of the creepiest Real-World locations ever. * Track down haunted Real-World locations around the globe on the interactive map (Uses an integrated iPhone Google Map App) Zoom in on places and see the Actual Satellite Image of the location and everything around it!! - Think of the Map Of The Real World as The Hunt's 'Playing Board,' think it's big enough? 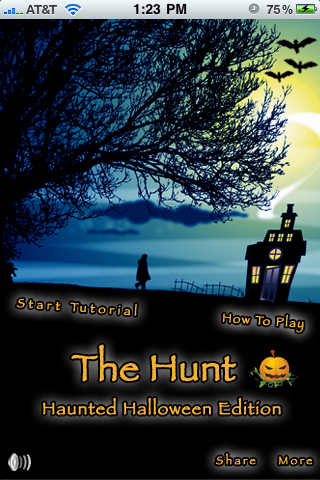 The Hunt - Haunted Halloween Episode 1.0 is 99 cents and is available worldwide exclusively through the App Store in the Games category.